Close your eyes. Hear the haunting call of the loon. Feel the soft lake breeze on your face. Notice the slow tug of your kayak paddle as it glides across the water. 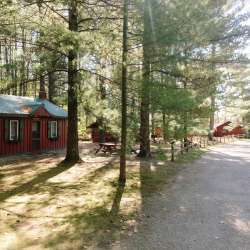 You’re not imagining things…these are the real sensations you’ll experience at Ellis Lake Resort, an Up North getaway that connects you so completely to the natural beauty of our area. 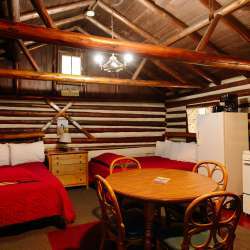 Ellis Lake Resort has seven cabins that can sleep from two to seven people. 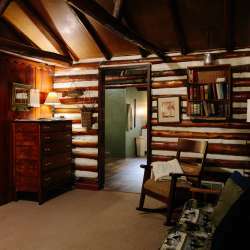 The cabins have an open design, which encourages a lot of family time playing board games, sharing stories, and the like. The resort also has the Chalet, a gracious, three-bedroom home that sleeps eight to nine people. Additionally, it has the Willow Suite—also with an open design—that sleeps six. Each unit comes with its own fire pit, a must for those summer bonfires with gooey s’mores and scary stories. Complimentary canoes and paddleboats are available for use, which are perfect for exploring the small, pristine lake. The resort is open year-round, attracting mostly families in summertime, many of which have been coming here for generations. Couples often come here in fall to enjoy the cooler temperatures and, amazing colors, along with the variety of wine tours. In winter, Ellis Lake Resort is transformed into a peaceful, white wonderland, where guests can enjoy cross-country skiing on nearby trails and snowshoeing through the woods. Not to mention the outdoor hot tub…ideal for star gazing on frosty winter nights.